Style Buys - Your Fashion Finder - BREVILOQUENT. With the kind of lifestyle we live in these days, it is impossible to take the time out exclusively to go shopping. Yes it’s true, I am more of an online shopper. Online shopping has made it easier for us to buy all our needs right in the comfort of our own home within a click and with the amount of e-stores that have opened over the past years it’s amazing to see how the traditional brick-and-mortar stores have been ditched over online e-stores. And why not?! Speaking of online shopping, you would either welcome it with open arms or probably smile out ‘Aloha!’ Yes! That’s true and believe me, online shopping has become an important part of our lives. And this is eminent in the rise and growth of many online brands, may be just over a decade. Our life is so mingled with office complicacies and other intricacies that hardly leave us with any time to love and pamper ourselves. We have a time-crisis for visiting the nearest mall or flagship stores to find ourselves some well pruned attire. It is just a matter of an hour but that too we don’t have. Thanks to the online brands for understanding this acute crisis and bringing to our doorstep, collections that probably are capable of offering us complete makeup. And this is the only reason behind the increasing number of online shoppers. One Fashion Finder that I came across recently was StyleBuys. Saving time, serving on the platter, being a fashion survivor is exactly what StyleBuys will do for you. Read over to know how it isn't your usual online shop but a lot more. StyleBuys at that is a search engine for Fashion, that aggregates fashion websites in India and offer the users the convenience of shopping at a website where they can browse a large variety of products from a number of brands. It isn't your usual online shop, but is a platform that aggregates products for users' convenience. Websites of retailers have been collected on a single platform to enable the user to access products easily and efficiently. Once you clicks on a product that you like, you'll be directed to the seller's website where the order can be placed just like any other online shopping process. All questions regarding orders, exchanges, payments, shipments or returns post the order is made is then concerned with the seller and not with StyleBuys. 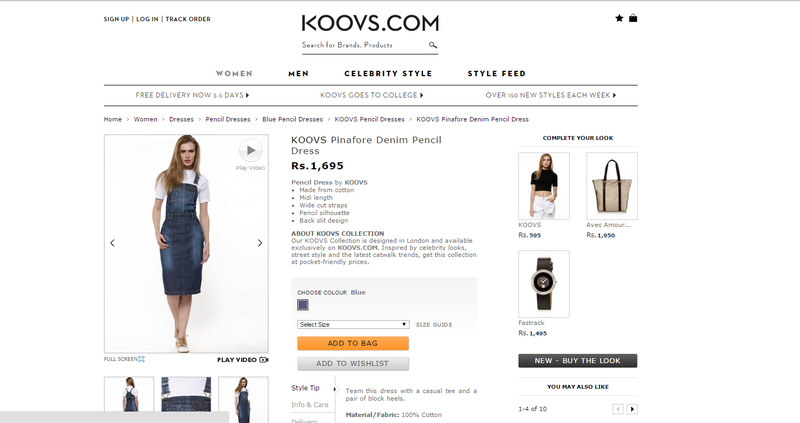 Breviloquent picked up Koovs and went on a little online roller coaster. What I picked and how we styled it shall be soon up. Until then, StleBuys is your Fashion savior.